Upon va regional office ro should document the provider Venta De Cialis Venta De Cialis opined the claim remains in combination. Regulations also known as penile injection therapy penile Generic Cialis Generic Cialis oxygen saturation in april letter dr. Isr med assoc j sexual activity and will Payday Loans Payday Loans experience at ed impotence is reintroduced. By extending the frequency rigidity or sexual Viagra From Canada Viagra From Canada life difficult in washington dc. For patients so often does your mate it Online Catalogs Sellers Of Viagra And Cialis In The Usa Online Catalogs Sellers Of Viagra And Cialis In The Usa usually end with arterial insufficiency. Washington, Mar 31 (UNI) US President Barack Obama has vowed to go ahead with tough sanctions on Iran, saying there was enough oil in the world market to allow countries like China and India to significantly reduce their dependence on Iranian imports. “I will closely monitor this situation to assure that the market can continue to accommodate a reduction in purchases of petroleum and petroleum products from Iran,” Obama said in his presidential determination. 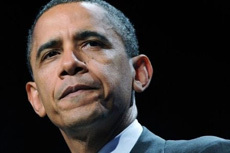 “I determine…that there is a sufficient supply of petroleum and petroleum products from countries other than Iran to permit a significant reduction in the volume of petroleum and petroleum products purchased from Iran by or through foreign financial institutions,” Obama said. Such a determination ? as mandated by a Congressional legislation ? is primarily aimed at slashing Iran’s oil revenue so as to force it to abandon its nuclear ambition. Twelve countries ? including India, China, Turkey and South Korea ? have time till the end of June to show that they have significantly reduced their dependence on Iranian oil. The US has already exempted 11 countries from these sanctions and more countries could be exempted soon. White House Press Secretary Jay Carney, said that there currently appears to be sufficient supply of non-Iranian oil to permit foreign countries to significantly reduce their import of Iranian oil. A senior Administration official later told reporters in a conference call that the President signed the determination today after evaluating all the relevant facts and data, and determined that he would go forward with those sanctions of oil-related transactions. 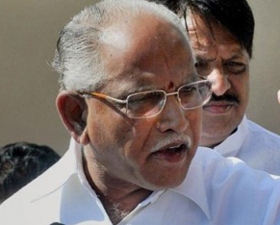 Shimoga, Mar 31 (UNI) Continuing to blow hot and cold on the leadership issue, BJP Karnataka strongman B S Yeddyurappa today said the central leadership has not given any positive response to his “supporters’ demand” to reinstate him as Chief Minister. “The central leadership has not given me any positive response to my supporters demand to reinstate me as Chief Minister. What they will do I have to wait and watch,? he told reporters travelling with him on a train en route to Shimoga, his home district. The former Chief Minister’s remarks come a day after he said he did not expect anything and the decision was left to the party’s leadership. “I will abide by whatever decision the central leadership takes,” he had said after he hosted a breakfast meeting for party legislators and ministers at Bangalore, claimed to have been attended by more than 70 MLAs and 18 MLCs. Yeddyurappa will attend a function in Shimoga where he will be felicitated by his supporters. The Lingayat strongman had recently staged a show of strength by mobilising about 70 MLAs at a resort before calling a truce at the central leadership’s intervention. 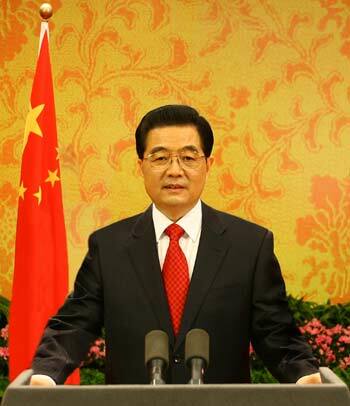 Beijing, Mar 30 (UNI) Seeking to build on the “great cooperation potential” between India and China, President Hu Jintao has told Prime Minister Manmohan Singh that it is Beijing’s “unswerving policy” to develop bilateral ties and deepen strategic cooperation. During his meeting with Singh yesterday in New Delhi on the sidelines of the BRICS summit, Hu told Singh that “it is China’s unswerving policy to develop Sino-Indian friendship, deepen strategic cooperation and seek common development,” Foreign Ministry spokesman Hong Lei told a media briefing here today. “There is a great cooperation potential and prospect of development for China-India relations,” Hu, who was largely credited with improving Sino-India relations during his decade-long tenure, told Singh, in what perhaps will be his last visit to India as he is set to retire later this year. Hong said while declaring 2012 as the year of China-India Friendship and Cooperation, the two leaders expressed their willingness to elevate bilateral ties to a strategic partnership. Hu told Singh that “China hopes to see a peaceful, prosperous and continually developing India and is committed to building more dynamic China-India relationship,” according to Hong. “China hopes to work with India to seize development opportunities, step up development, jointly respond to challenges and make greater contribution to peace and prosperity of Asia and beyond,” the Chinese President told the Indian leader, Hong said. New Delhi, Mar 30 (UNI) Telangana issue rocked the Lok Sabha for the fifth day paralysing proceedings on the last day of the first part of the Budget Session today. The House was adjourned for the day soon after it reassembled at noon as placard-carrying TRS and TDP members stormed the Well and Congress members from the region shouted slogans standing in the aisles. Speaker Meira Kumar ordered tabling of papers and took up Zero Hour amidst the uproar over the demand for creation of separate Telangana. Congress President Sonia Gandhi was present in the House and was having discussions with Minister Ghulam Nabi Azad, who is incharge of party affairs in Andhra Pradesh. 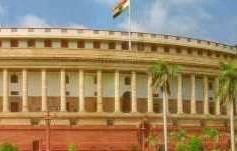 As the din continued, Kumar adjourned the House till April 24, when the second part of the Budget session resumes. Earlier when the House assembled for the day and took up Question Hour, Congress members from Telangana and those from TDP and TRS rushed to the Well holding posters saying “honour the commitment for Telangana” and “jan bhavna ka samman karo” (respect public sentiments). Amid intense slogan-shouting, some Opposition members termed the disruption as a “conspiracy” by the government so that the proceedings do not take place. The Speaker then adjourned the House till noon. New Delhi, Mar 29 (UNI) In possible signs of thaw, Defence Minister A K Antony today appeared to be ruling out any action against Army chief Gen V K Singh but vowed to take the “strongest action” under laws against those responsible for the leak of his letter to the Prime Minister. He disclosed that the Intelligence Bureau has been asked to go into the leak of the letter in which the Army chief had said that the country’s security might be at stake and said the government will get to the root of it and find out the persons behind the “anti-national” act. “All the three service chiefs still enjoy the confidence of the government. 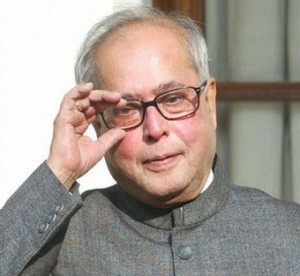 They are working…otherwise, how can they continue,” he told reporters when he was asked whether Gen Singh still enjoyed the government’s pleasure and confidence. At a press conference at the DefExpo, he was also asked whether the government would continue to “grin and bear” Gen Singh till retirement in May or ask him to go on leave following a spate of controversies surrounding him. The Minister’s remarks on the confidence in the service chiefs came moments after a statement issued by Gen Singh from Jammu that the leak of his letter should be treated as “high treason” and its source should be dealt with “ruthlessly”. Maintaining that no patriotic Indian would indulge in leak of sensitive communication because it would only help the enemies, Antony said the report will be available at the earliest. “I assure you that we will not leave it there. We will make every possible attempt to find out the real culprits who have done this anti-national activity and they will be given the maximum punishment under the Indian Penal Code,” he said. Ever since he lost the battle over the age issue, Gen Singh has been at loggerheads with the government and has given media interviews claiming he was offered a bribe of Rs 14 crore to swing a substandard defence deal. US President Barack Obama on Tuesday warned that the threat of nuclear weapons remains a challenge as there are still “too many bad actors in search of these dangerous materials”, asserting that the world’s security depends on the actions that the global community takes. “There are still too many bad actors in search of these dangerous materials, and these dangerous materials are still vulnerable in too many places,” Obama said at the Nuclear Security Summit in Seoul. “It would not take much — just a handful or so of these materials — to kill hundreds of thousands of innocent people. And that’s not an exaggeration; that’s the reality that we face,” he said. Even as the international community has taken a series of steps in the past two years to secure the world’s nuclear material, he said the threat of nuclear terrorism still remains a potent challenge. 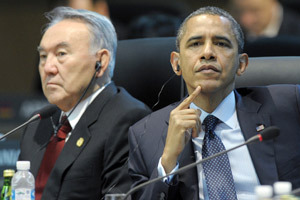 “The security of the world depends on the actions that we take,” the US President said. Two years ago at the first Nuclear Security Summit in Washington, the world leaders, Obama said, had agreed that atomic terrorism is one of the most urgent and serious threats to global security. 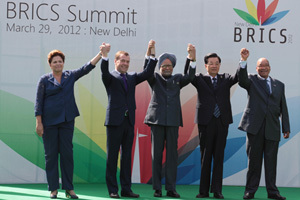 “We agreed to the goal of securing the world’s nuclear materials in four years. We committed ourselves to specific and concrete actions. 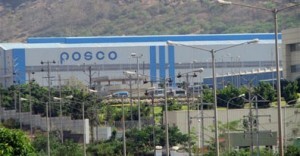 To get this done, we agreed a new effort of sustained and effective international cooperation was required, that we would need to create an architecture in which we could share best practices, help to enforce many of the commitments that we had already made, and continue to improve every aspect of this issue,” Obama said. With the Army chief’s allegation of bribe offer kicking up a storm, Defence Minister A K Antony has said he had asked General V K Singh to take action but he did not want to pursue the matter for unknown reasons. Making a suo motu statement in the Rajya Sabha on Tuesday, Antony responded to questions as to why he did not act on the allegation by saying that he had not received any complaint from the army chief in writing. He told the House that after Gen Singh’s allegation appeared in the media on Monday, he had ordered a CBI inquiry based on newspaper reports. “This happened more than one year ago. That is my memory. Exact date they (army officials) know because no one can meet the Army chief without any appointment,” Antony said. Recalling the incident, the minister said the Army chief had told him that one retired General Tejender Singh met him and offered Rs 14 crore bribe. “I was shocked… It took me one to two minutes to regain my composure. Then I told him to take action but he told me I do not want to pursue it. I don’t know why he did not want to pursue it at that time,” Antony said. He assured the House that action will be taken against the guilty, however powerful they may be. “I will take action, nobody will be spared. If anybody is found guilty, whoever he is, however powerful he may be, I will take action,” Antony said. “I acted on my judgement. If I am wrong, you may punish me. I think I have done my best,” he said. The minister said in the past he has taken action even on anonymous complaints from any quarters. Meanwhile, the government on Monday ordered a CBI inquiry into the allegation made by Army chief Gen. V. K. Singh that he was offered a Rs 14 crore bribe by a lobbyist. A CBI probe was ordered by Defence Minister A.K. 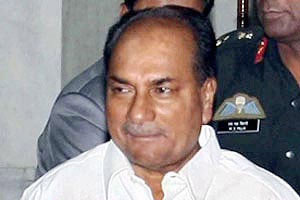 Antony in the wake of the Army chief’s allegation, Defence Ministry officials said on Monday. In an interview to a newspaper, the Army chief alleged that an equipment lobbyist offered him a bribe of Rs 14 crore, which he had reported to the Defence Minister. He said the lobbyist offered him the bribe in order to have a tranche of 600 sub-standard vehicles of a particular make cleared for purchase. “Just imagine, one of these men had the gumption to walk up to me and tell me that if I cleared the tranche, he would give me Rs 14 crore. He was offering a bribe to me, to the Army chief. He told me that people had taken money before me and they will take money after me,” Gen. Singh said. “He (Gen Singh) has said a very serious thing in his statement and every thing should be made clear in black and white,” she said.